Amko Rice Bran Oil – is a healthy golden oil with an extremely subtle taste. Cholesterol free and high in unsaturated fatty acids, rich in essential Omega 3,6 and Vitamin E making it a healthy alternative to olive oil. With a very high smoke point above 250c it’s one of the cleanest frying oils available. Suitable for vegetarian and gluten free diets. 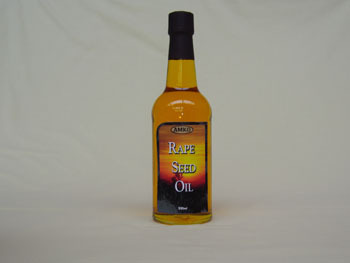 Amko Rapeseed Oil is half the saturated fat level of live oil, additive free and high in Omega 3. It’s delicate taste makes it versaile for baking, frying roasting and salad dressings. Suitable for vegetarians and gluten free diets.